I ate my first “slice” of strawberry glazed pie as a California kid enjoying strawberry season. I might be a thousand miles away now, but this is still the first pie I want to make when the spring strawberries make their way north. This pie doesn’t cut well so it’s best just to give up, serve in a bowl, and realize it’s all about the pure strawberry experience. 1. Rinse strawberries, twist off the leafy tops, and hull out the cores with a strawberry huller. Set aside in a large bowl. 2. 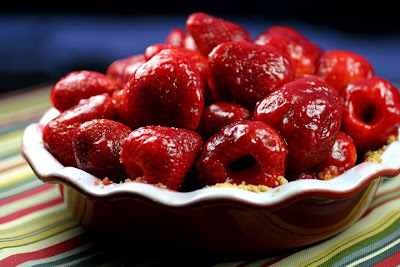 In a blender or food processor puree 1 cup of the strawberries, granulated sugar, cornstarch, water and salt until smooth. Transfer to a saucepan and heat to a boil stirring frequently. Once it comes to a boil stir constantly until thickened. About 2 to 3 minutes. 3. Turn off the heat and add the butter and food coloring. Stir until the butter is melted. 4. Pour the hot glaze into the bowl and toss gently to coat the strawberries. Spoon into the pie crust and arrange nicely. 5. Chill if you have the patience to wait for fresh strawberry pie. Whipped cream is optional. Oh that looks and sounds divine!! I'm so happy that I found your blog!! Thank-you Rhonda. I am glad I found yours through your post! The cake and sugar site is a work of beauty. Laura, this is just beautiful! I love strawberries. That is ONE wonderful looking pie! That is one good looking pie!! Where did you get those strawberries? They look like the best of the season! That looks so delicious. I'll definitely have to try making it. Thanks for sharing the recipe. I got the strawberries at Safeway. They were so beautiful! Oh my good heavens! That looks so delicious!! Thank you for the recipe! Still lovin this pie, you make the most beautiful things.